Tom is a professional artist who is also an active competitor in regional, national and international carving competitions, receiving numerous awards. Most recently he won best of show – two years running in Cape May at the Wings and Water festival in 2010 and 2011, 3rd best of show – IWCA shorebird decoy at the ODCCA in Ohio and 3rd best of show – open interpretive at the Ward World Championships. Tom also represents nature and wildfowl through watercolor and photography. His love of birds and the great outdoors combined with his artistry has been a part of his life for as long as he can remember. 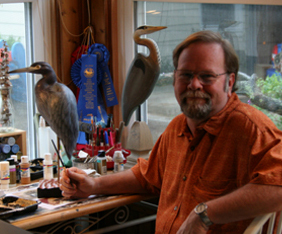 As a career commercial artist, Tom discovered his passion for wildfowl carving in 1982, on a trip to Chincoteague, Virginia. a community steeped in the historical carving traditions of the east coast. The local artists there gave Tom some basic pointers and advice and he has been hooked on wildfowl carving ever since. Tom grew up in Wadsworth, Ohio and came by his artistry naturally from both his parents who were artists as well. They exposed him to both the artistic world and the natural world. That natural world is part of his life long commitment to the environment, demonstrated in his past service as a member on the Medina County Friends of the Park Board. He carved a great blue heron for the Medina County Parks as a fund raiser for the seed money to start the Wolf Creek Educational Environmental Center in Sharon, Ohio. He also designed Holmesbrook Park, a nature park located in Wadsworth, Ohio. Tom also served 5 terms as a councilman for the City of Wadsworth where he championed additional park trail development and natural recreation projects. He lives with his wife, Barbara, and their two dogs, “Traveler” and “Lumi,” in Cuyahoga Falls, Ohio, located in the heart of the Cuyahoga Valley National Park system where he continues to pursue his love of nature and wildfowl art.